Thailand is renowned for its variety and quality of orchids, and the Mae Sa Valley, north of Chiang Mai, is the place to go to see their beauty at the source. At the Mae Sa Orchid Farm, visitors can see more than 50 varieties of orchids and wander through a live butterfly enclosure filled with colorful and fragrant tropical plants. Most travelers visiting the Mae Sa Orchid Farm arrive as part of a guided tour of the beautiful Mae Sa Valley. A typical day trip might involve a morning hike through the rain forest of Northern Thailand, a picnic lunch by a waterfall, and an afternoon of cycling down rural country roads to the orchid farm. Those traveling independently often combine a visit to the orchid farm with a trip to the nearby Mae Sa elephant camp. The Mae Sa Orchid Farm is popular with families and active travelers. Give yourself 30 minutes to an hour to wander the farm facilities. The farm is home to an on-site restaurant where you can grab lunch or a drink. Mae Sa Valley day trips that include the orchid farm typically last around nine hours. The Mae Sa Orchid Farm is located off Maerim-Samoeng Road on Highway 107 from Chiang Mai. Most visitors come as part of a guided tour from Chiang Mai. The Mae Sa Orchid Farm is open daily from 7:30am to 4:30pm. Since the orchids and butterflies are located indoors, it’s a good option to escape the rain or afternoon heat. 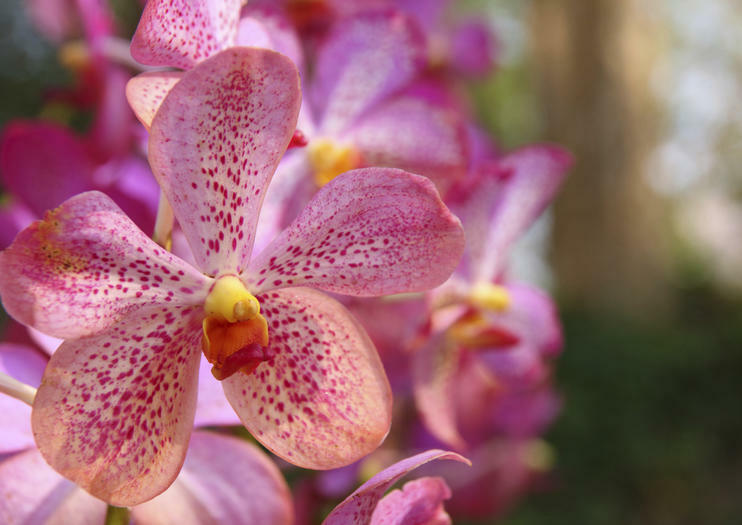 Thailand is home to about 1,300 species of orchids, many of which still grow naturally in the wild. The country is also the largest exporter of orchids in the world, with many of them sent to China, Japan, and the US. There are so many beautiful things to see and places to go in Thailand that it can be hard for travelers to narrow down an itinerary. On this six-day tour you’ll visit a number of beautiful and memorable sights in the northern parts of the country. You’ll fit in much more than you’d be able to if traveling independently, and won’t have to worry about logistics as everything will be taken care of for you. Hike and bike through Mae Sa Valley during this active tour from Chiang Mai. Start with a 2-hour morning hike that takes you past hill tribe villages and rice paddies, and into the lush rain forest of northern Thailand. Rest by a waterfall and refuel with a buffet Thai lunch before your afternoon bike ride. Ride down a combination of paved and dirt roads that lead through the rural valley to an orchid farm where your bike ride ends. Transfer to your Chiang Mai hotel to wrap up a memorable day. Visit Elephant tour at the most popular elephant camp in Chiang Mai and appreciate with Chiang Mai elephant appear from the most celebrated camp - Incredible neck length of the woman from the Long neck village and to Tiger Kingdom.